Earlier this summer, Bullfrog Power joined the Kluane First Nation for the groundbreaking ceremony of its Kluane N'Tsi (Wind) Energy Project. When completed, the project—which Bullfrog is supporting—will enable the First Nation to become the first independent power producer in the Yukon Territory. 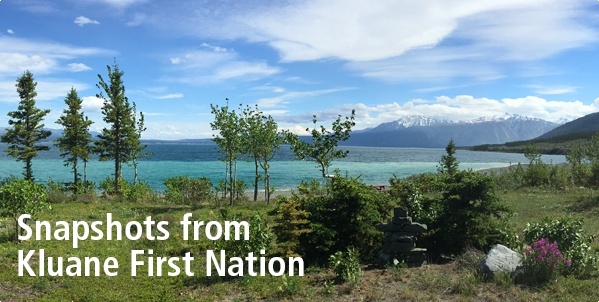 During his visit to the Yukon, Bullfrog's Dave Borins captured the beauty of the Kluane First Nation and its surrounding area—check out our photo gallery. Three years ago, the Ecology Action Centre—an environmental nonprofit in Nova Scotia—conducted a massive renovation of its office: an old saltbox house in Halifax’s North End. In this blog post, we asked the Centre's Joanna Bull about the experience, and for tips on how you can incorporate green building practices into your next home renovation. We’re excited about Beau's Brewing Co.'s upcoming Oktoberfest celebration just outside Ottawa, but don’t let the name fool you—the event is actually in September! To prepare, we picked the brain of Graeme Cunningham, Bullfrog's own Beau’s super-fan, for his top reasons to attend: check them out. Plan on attending? Use promo code BULLFROGPOWER when signing up for a $5 discount off your order. You're invited to Secondhand Sunday! Toronto neighbourhoods are invited to join Secondhand Sunday on September 30 to share reusable, unwanted belongings with neighbours. Co-organized by Bullfrog customer and musician Caroline Brooks, Secondhand Sunday aims to reduce our collective environmental footprint by sharing and reusing items. That "thing" your neighbour no longer wants could be exactly what you need! Learn how you can take part. 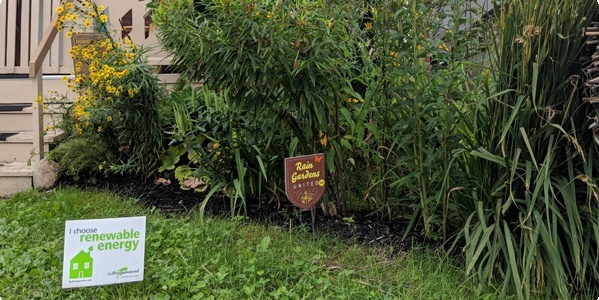 Longtime Bullfrog Power customer Marc Yamaguchi sent us a snapshot of his Bullfrog lawn sign adorning his lush rain garden. Rain gardens are landscaped plots that absorb storm water—reducing basement flooding, diverting water from city waterways and preventing pollutants from entering our storm drains. Learn more about the environmental benefits of rain gardens at Rain Gardens United!